“Hybrid full length” is a ultra rigid solution that offers corner-pillars in full length. Available lengths are 670 and 900 mm. The Hybrid Full Length rack consists of 900 or 670 mm Corner-Pillars, the Hybrid-Shelf-Kit and a dedicated Hybrid turn table shelf supported by the unsurpassed Hybrid Isolation System (optional). In the 900 mm version the total available space between the three shelf trays is 680 mm. 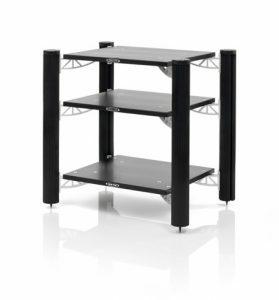 The user can freely determine the amount of shelfes to use pending the equipment sizes, as the shelfes are fully adjustable along the corner-pillar length.